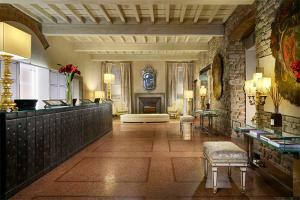 This luxury hotel is located in the historic center of Florence, overlooking Brunelleschi's Cathedral and only a stone's throw away from the Uffizi Gallery and "Piazza della Signoria." The hotel was created within a circular Byzantine tower and a medieval church, entirely reconstructed, but keeping the original characteristics of the buildings. The 96 beautifully appointed rooms and suites are equipped with a host of modern amenities.